Went out this evening and caught around 8 LMB in my pond. Caught most of them in a chartreuse spinner-bait and some others on a zoom worm. All of the fish were within 10 to 13 inches long. I have some pictures and as soon as I can get them uploaded I will post them here. Hoping you guys can diagnose my LMB situation, and tell me if they are stunted or the pond is just over-run with these size bass. I have caught 2 larger bass, both about 2 to 3 pounds. I'm no expert, that's why I'm here, but fish #1 appears healthier to me. Are they both native largemouth bass or Florida? I don't know what kind of bass were stocked in the pond..sorry. That LMB looks awful thin. I've been trying to reverse the effects of stunted bass myself. While my LMB started out 9-11" as opposed to your 10-13", the bass in your picture appears to be as thin as mine were. Would you say that the other bass are as thin as that one? I'd hate to give me opinion after seeing only one fish, but if that fish is typical, my guess would be that they are starting to stunt. How many bass can you catch in a given time of fishing? When we first got the pond with our stunted LMB, I could catch at least 30 LMB per day without hardly trying (4 acre pond). I think your catch rate, in addition to their size, will tell you quite a bit about what you have. EDIT: The size of the fish's tail in that second pic seems disproportionally large compared to both the head and the body. Wait for the experts to chime in, but it appears to me they're at least thin (if not stunted). Thanks for the reply, Yes I would say that is a good example of the bass I am catching. Once I found out what they wanted to bite I caught them pretty well until it got dark. A cold front is coming through tomorrow so it was cloudy today with an off and on south wind. Not to hijack your thread, but here is a pic of a few LMB I harvested this weekend out of the pond I mentioned in the last post. I post this mainly for comparison. In my opinion (and I could very well be wrong), my LMB are still stunted, although they're also getting bigger as my management is slowly but surely starting to work. The average length and weight is up slightly and climbing. Based on the photos alone, I would say we have similar situations. 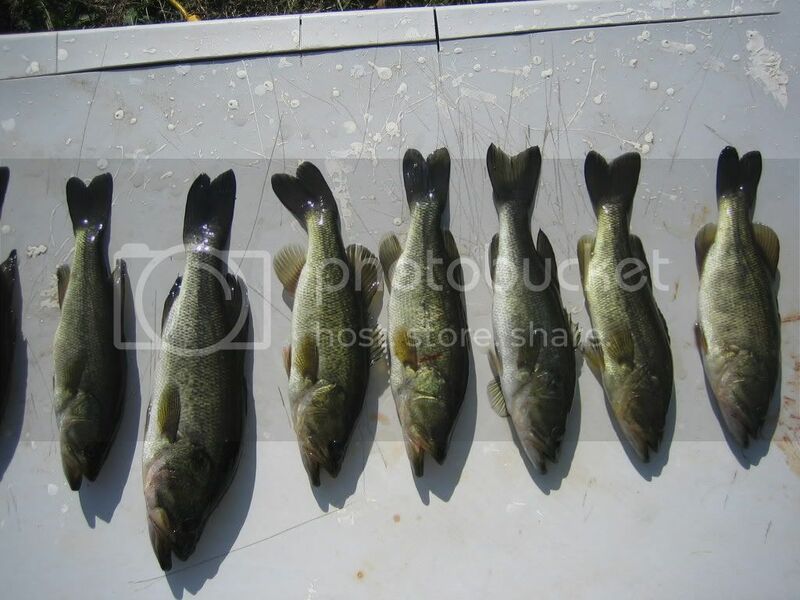 The largest LMB in that pic was culled because he is still too skinny even though he is larger than the others. Other (very few) LMB that size and bigger have more girth. #1 = thin, #2 = very thin. I run a LMB-crowded pond to try and grow large BG; my bass typically run about RW = 90. Your bass are thinner IMO. WRT Northern vs. Florida, I think it's hard to tell from photos and impossible to be sure without (destructive) genetic testing. I notice on both your bass and David's, the stomachs are generally sunken slightly. Optimum weight for a 12" bass is 14oz. If they are weighing much less than that you may have too many predators. Catch em and keep em or throw them on the bank. I had the same problem with stunted bass. Start keeping records. Weigh and measure all your bass. It won't take long once you start harvesting to see a noticable improvement. Dvasta, how did you get those bass to stick to the wall like that? Just my 'ol fish-cleanin' table. It's seen better days, but it still works like a charm. Here's a picture from a different angle. I figured I would have some problems to tackle with the pond being about 18 years old and we just bought the property 3 months ago. Next chance I get I will go out and catch all the bass I can and keep them all. Hopefully I can found someone that might want some. Those LMB both sets are under weight. One word of caution. RW are a very good tool but note that it is an average not just on length/weight but also time of year. For example if those fish were all caught just prior to spawning time with a RW of 75 that is very bad because about 1 mth later their RWs will be 65% +-. Good choice on the chartreuse spinnerbait. One of my favorites. How big is the pond? In addition to culling any bass under 12-13", it's usually best to stock BG over 4" (I prefer over 6") to provide a good spawning stock of forage that the 12" LMB cannot eat. Doing both of those will produce bigger LMB. Sure, you won't catch as many LMB as fast, but when you set the hook, it'll bring a smile to your face. Before we give you any more recommendations, what are YOUR goals? If you, like Theo, are trying to grow large BG/RES, then having an abundance of small LMB is a good thing. My goal is a greater number of 3-5 pound LMB, which is why I am culling the smaller, stunted ones. I am in North Central Louisiana, just south of Ruston, LA. The pond has various terrain ranging from one end that is up to 17 feet deep to the other end which is a shallow flat where a small creek feeds the pond. The problem will start correcting itself without supplemental stocking, in my experience. I've only stocked about 50 large BG by hand because I can't afford it either, and I'm already seeing results. The culling is the main thing at this point. The fewer the mouths left in the pond, the more food for the others. Back in October we went a few times and caught a nice mess of 5 to 6 inch BG on crickets. I have also seen quite a few smaller BG but so far no trophy sized BG. d that is correct provided there are enough adult BG to reproduce enough offspring at the predation level and provided you don't take to many out. this sunday some of the in-laws are coming so I am going to go after the bluegills, catfish, and white crappie to see what kind of size averages i'm working with. I'll be sure and take pictures so you guys can tell me how healthy, stressed, etc. the fish look. Don't remove any bluegill at this point though. ohhhh??? guess we'll throw em all back then and keep the bass? What about the white crappie? I think most of us woud say remove every Crappie you catch. Alright Mr. Gallus, any hope that I will have a sustainable white crappie population. Them Sac-a-lait sure are good eating. ericdc, if I were trying to manage for Crappie, I would definitely want a lot of medium-sized, under weight, hungry LMB to keep their numbers in check. That seems to be the situation you are in, showing that this Crappie management approach works in a least some ponds. If you reduce bass numbers to get larger, fatter bass, your Crappie situation may change. I sure don't know enough to be sure; I'm not sure anyone can predict Crappie populations in different ponds. I guess If I have to sacrifice some bass size for a good crappie population I would. They are far better to eat. I want good fishing for at least 2 of the 4 species. LMB, BG, CC or Crappie. went out this evening and caught a dozen or so LMB. About half of them were nice and fat..not very big, but they were fat and healthy. The other half were really skinny. I need to remove the skinny ones and let the healthy fat ones get bigger. I plan on going after some crappie with shiners very soon. Eric....Does Louisianna Fish & Game help landowners manage ponds? I know some states have programs where they can come in and do electro shocking and see what you have. That may be an option for you. If they do not, then you need to find a biologist on a local lake and befriend them. Maybe help them to do some projects in return for looking at your pond. I have helped with conservation projects in Kansas and most of the biologists have given me great advice for my pond.